7 сентября в Штутгарт, Баден-Вюртемберг, Германия, состоялся бой среди боксеров во втором среднем весе (до 76,2 кг) — Крис Юбэнк против Авни Йылдырым . Chris Eubank Jr vs Avni Yildirim. On September 7 in Stuttgart, Baden-Wurttemberg, Germany, a fight will take place among boxers in the second middleweight (up to 76.2 kg) — Chris Eubank UK vs. Avni Yildirim Turkey. Chris Eubank Jr vs Avni Yildirim. The percentage of early wins by Chris Eubank KOs is 73%. The percentage of early victories Avni Yildirim KOs 63%. 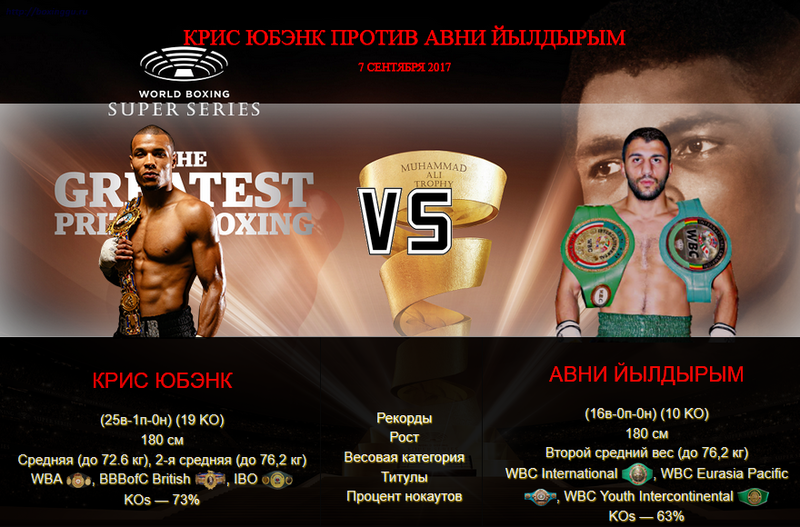 The fight for the IBO World Middleweight title.